What happens to the ribbon of land being created by the depression of the Central Artery may be the most important development decision to face Boston in a generation. Do you have questions or comments about this section? We welcome your feedback. Click here to contact us. HUBERT MURRAY Architect + Planner / Public Placemakers / Jung Brannen Associates. The creation of five distinct open spaces: Channel Gardens, Fort Point Plaza, India Gardens, Harbor Park and Marketplace Gardens. The creation of zones of activity near the open spaces: A museum complex, a visual and performing arts complex, and a Harbor Orientation and Visitors' Services zone. The management and organization of Harbor Gardens to be vested in a public, non-profit cultural developmental authority responsible for development, programming and maintenance. 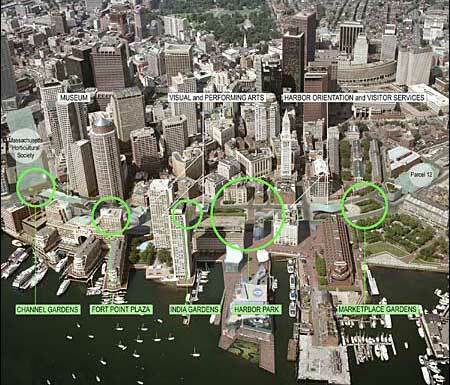 This study has developed from work that has been undertaken by the Artery Business Committee Waterfront / Financial District Working Group regarding the creation of successful public space in the central section of Boston's Central Artery / Tunnel Project corridor. From 1998 through 1999 the Group worked together on ideas for design and programming that as neighbors and abutters they would like to see on Central Artery parcels 12 through 18. This diverse group of residents, office workers, owners, interest groups and non-profit organizations came to a consensus in supporting Five Principles for Design and Programming for this part of the city, finalized in a report in August 1999. This section of the Central Artery corridor is now known as the Wharf District, recognizing the history of the neighborhood as Boston's original waterfront as well as its potential for being a critical link between the city and the harbor. The Five Principles were conceived and written as guidelines to the Turnpike Authority and constituted part of the briefing to the Authority's master plan consultants following their selection in January 2000. The principles are summarized herein. The outcome of this study is to describe a design program for the Wharf District that encompasses the development of open space and cultural institutions as equal, complementary components of vital and successful civic space for downtown Boston. A summary of the Five Principles for Design and Programming as developed by the Waterfront / Financial District Working Group. This document examines ways in which Harbor Gardens destination points might enliven park spaces and reunite the city with the harbor. This document describes the area of land that Harbor Gardens might comprise, including urban form and physical and regulatory framework. This document outlines the conceptual pieces of Harbor Gardens, including five new parks and three destinations. A storehouse of urban landscape concepts that have been realized throughout the U.S.
Information for this section was provided by the Artery Business Committee.